(For context) I could allow it for some features, e.g. the ones that use events that provide the World object, but it would only be a few. The BiomeManager isn't dimension specific, and neither is the event that BT uses to replace biomes, unfortunately. Yea I looked at that code a while ago. I want Ridiculous world biomes in the witchery dream dimension, but so far haven't found a mod that can do it, nor do I have to motivation to try it myself. Was just wondering if you did anything in this mod that would make it possible. Dimensional Control should be able to do that for you. It's a very powerful tool once you get familiar with it. It should? Okay definatley going to try that then, thanks. Okay i need some help, i cant get BiomeTweaker to work and i really dont know why D: This should work... right? I'm quite curious if it's possible to use this to make AM2's Witchwood biome color not be that ugly white. You should be able to. The color setting should work for all biomes, modded or not. The only mod I have enabled is this one, and the game just crashes immediately upon pressing "Play". Submit a proper bug report through the issue tracker and I'll be happy to help you. Yeah sorry I didn't do that in the first place, but I'm not getting a crash report in my .minecraft folder. The program just stops being there. Would the fml-client-latest.log and fml-junk-earlystartup.log help? Yeah, any logs you can give me. I even did a clean reinstall of 1.7.10 minecraft, then installed the newest forge, and only threw in biometweaker. The game still just stopped being there. Just disappeared, and does that every time I try. Your config file is incorrectly formatted. Delete it and have BiomeTweaker generate a new one. Didn't work with the latest version (as I've tried that a few times now), but your method did work with the version that has the most downloads. However, now that my game isn't crashing, the mod appears to not do what it says it does. 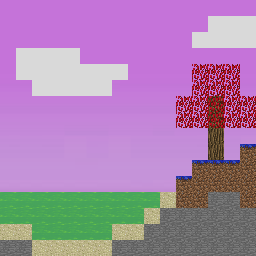 I changed the liquid filler for oceans to lava, and oceans are still made of water. I've also changed the top layer of deserts to dirt, and they're still sand. Every change I've made appears to not actually do anything so far. The config error you were having was because the version I uploaded actually had a malformed JSON config... I've just uploaded a fixed one. I don't know what to tell you about your issue now. I can guarantee the mod works, or it wouldn't be so popular. If you want any help, I'll again need logs, scripts, and configs. Well I've tried using your newest version, and that doesn't crash the game, thanks! So I've figured out more about this mod, and I believe I've configured it the way I need it, but for some reason it's not letting me get into worlds. It just keeps saying "Building terrain." I haven't done much at all, so it's very simple, and I think it should work, but there's obviously something wrong. I've also tried this, and it doesn't work. I actually spawned in a Plains biome, lol. Here's a file with my logs, and the configs I've done. Thanks for any help you can give! First of all, you need to tell me if you're running other mods alongside BiomeTweaker. I can see you're also running Biomes O' Plenty and Twilight Forest. Not really sure what to tell you about it not working. I loaded up a world with just a clean installation and then with BOP and TF - Both worked fine with your configuration. Can you provide me with the FML logs? Hmm, not entirely sure what I did differently, but now mines working too. Sorry to bug you with it! I'm loving this mod now that you've helped me get it working. I've made a huge wasteland type of world with very little in terms of resources. It's gonna be a challenge map for a few friends of mine.